What are the best Yard trees for your home? Bill the tree guy says that there are several types of trees which make beautiful yard trees for your home. There are several factors to think about when planning to plant. 1. Do I want year round foliage? Choose an Evergreen tree such as White Pine, Colorado Blue Spruce, Eastern or Canadian Hemlock, Arborvitae or one of my favorites the magnificent Giant Sequoia if you live in the Sierra Nevada area, these can live to 2500 years. 2. Do I want beautiful spring flowers? 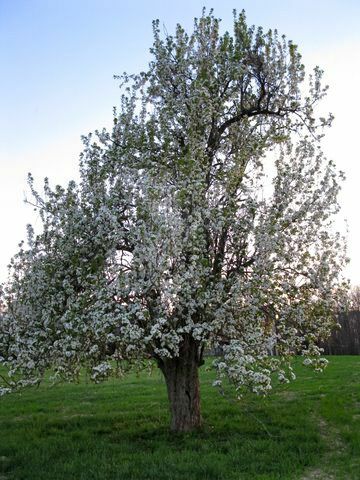 Choose trees such as Eastern Redbud, Saucer Cup Magnolia, White Dogwood, Japanese Yoshino Cherry Tree or a Pink Kwansa Japanese Cherry tree, Crabapple and Apple trees. 3. Do I want a fruit tree which also produces beautiful flowers in the spring? Choose a Apple tree from the following varieties: Yellow Transparent, Golden Delicious, Winesap, Honeycrisp, Gala, Granny Smith or Jonathan. Choose a Cherry tree which have beautiful flowers in the spring & bears fruit from the following: Montmorcey for pies, Bing, Black or Sweet Cherries for eating fresh. Choose a Yates-American Persimmon tree for fall fruit, be sure you make sure they are soft and ripe before you eat them or they will really pucker you up like nothing else. But when ripe they are fantastic to eat fresh or make into pudding. Plums are beautiful and good to eat fresh as are Pears such as Kiefer, Bartlett or Anjou. It is generally a good idea to plant two of different varieties of the same fruit in order to pollinate each other and get flowers & fruit. There are several varieties of flowering Crabapples with some producing excellent tart tasting fruits which can be eaten fresh as well have pink or white flowers in the springtime. Also strongly consider the Viburnum Juddii bush for both magnificent white flowers in the spring around Easter & which have the most fragrant smell of all. 4. Do I want beautiful fall color and trees to last generations? Choose a deciduous tree, which drop there leaves at the end of fall, but have gorgeous color bursting forth in all of God’s glory in the Autumn. Choose the Hard Sugar Maple tree for some of the most spectacular glorious fall color of all, Black Gum which has beautiful red color in Autumn, White Oak which holds its leaves through the winter, Red Oak, Scarlet Oak, Chinkapin Oak, Pin Oak, Burr Oak, American Beech, Hickory, American Chestnut, Liberty Gray Elm are all good yard trees. Red Maple are pretty but sometimes overbearing in dark purple red and often get diseased at about 20 years. My favorite tree of all is the European Copper Beech trees as for beauty they are unmatched. Their bark is smooth and gray. There are various hues of red to purple with copper being the preferred color. Only 25% of the specie makes it to copper in color, just as some people are brunette, some blond and some redhead. The American Beech often when 3 ft in diameter or larger become diseased and hollow, but since these trees grow so slow it will not be a problem for most home owners. It may take 150-200 years to reach 2-1/2 ft in diameter at breast height and have been know to live to 500 years. The European Beech does not seem to become diseased or hollow as much as the American variety and this is the stock which produces the Copper Beech (Fagus sylvatica Purpurea) which can be found as planted by Thomas Jefferson at his beloved Monticello home in Virginia, which he brought over from Europe. Another tree to consider which is beautiful to look at is the White Paper Bark Birch tree which has a white trunk and is often planted in groups of 3 or more. Remember that trees grow so don’t plant them too close to your house or driveway. 15-25 feet away from your house is a good rule of thumb. The most important thing to consider is the proper care of the bark to prevent disease and prolong the life of the tree. This is where the water and nourishment flows up to the tree just under the bark from the ground. You do not want to damage or scar the bark. The bark must be protected from damage at all costs, from lawnmower decks or weed eaters in order to prevent disease, wounds or premature death. The best prevention and solution is to use Round Up around the tree or to use a light amount of undyed mulch to prevent the desire of the lawn service from getting too close with the deck of the lawnmower while mowing the grass and or using a weed eater to make it look nice to the homeowner. Using the deck of the mower to cut close to the tree is a short sighted solution as grass is not the most important thing, the tree is. Never weed eat up to the bark or mow within 12″ of the trunk of the tree. Stay away from several trees such as the American Black Walnut & Sweet Gum as the nuts they drop stain and are a nuisance in the yard, Soft or Silver Maple as they become brittle and after about 20 years will break branches in wind storms and are drab in color, Hackberry, Weeping Willow, & Cottonwood as they are drab in color and a bane and will spread, especially near any water. Black Locust have thorns which can puncture tires and people and spread and tough to get rid of later. Mulberries are considered a weed tree by many as well. Would you like some more tips on home buying, click here to get my ebook.